Monarch MCO-22 Compressor. Made in japan around mid to late 80’s. Got this one in a trade. Could have bought it straight off, since the price was right. There is always something interesting in these 80’s japanese cheapos. 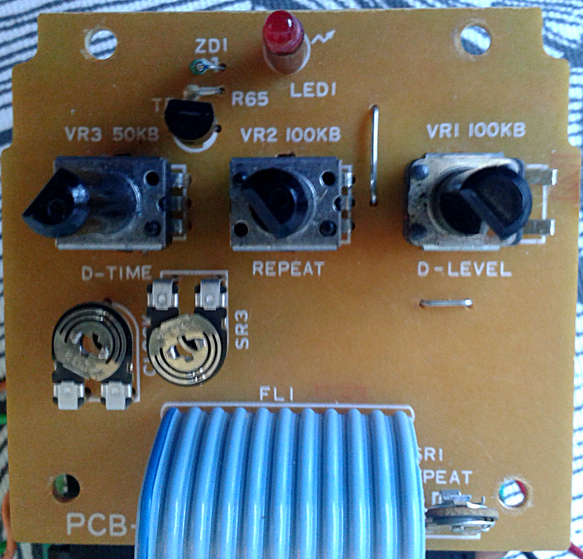 Mainly because most of them are really good sounding and usable circuits, despite their cheap and lousy plastic overall feel. 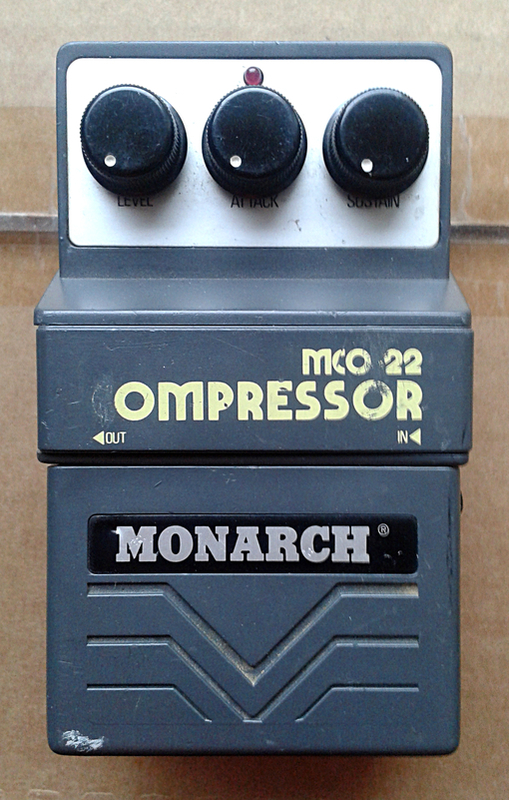 A little research pointed out that Monarch was a brand that was basically just OEM’d catalogue of Aria effect pedals. And as such, this pedal is exactly the same unit as Aria ACP-1 Compressor. This particular unit has seen some use too. 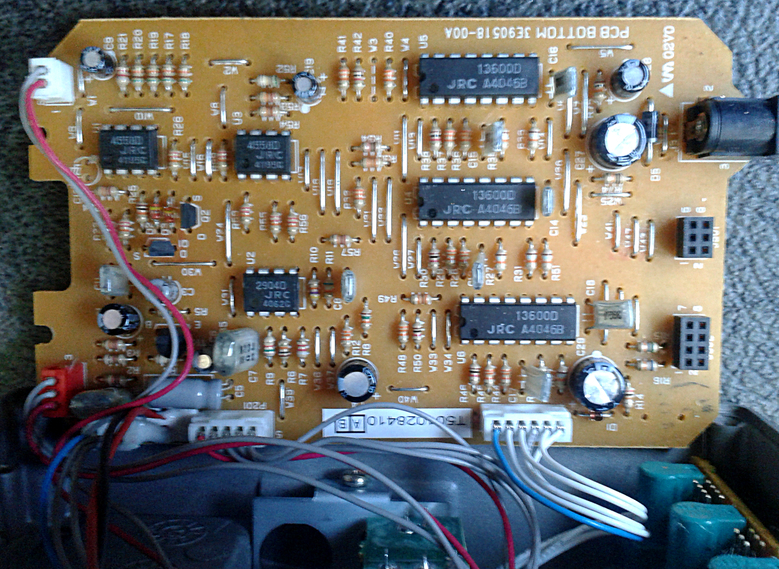 The knobs are not original, but for a unit that’s seen use this isn’t a surprise. Well. 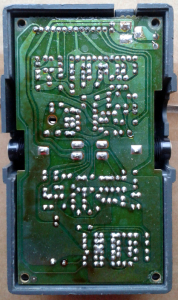 At least the plastic battery compartment cover is in its place. 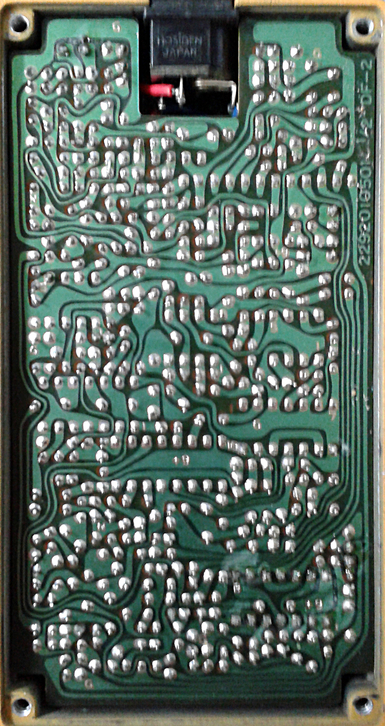 Of course i then needed to know what the electronic design held in store, so i opened it up. 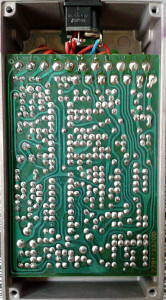 Typical japanese board design with pleasing looks and a mark of hand crafted trace design. 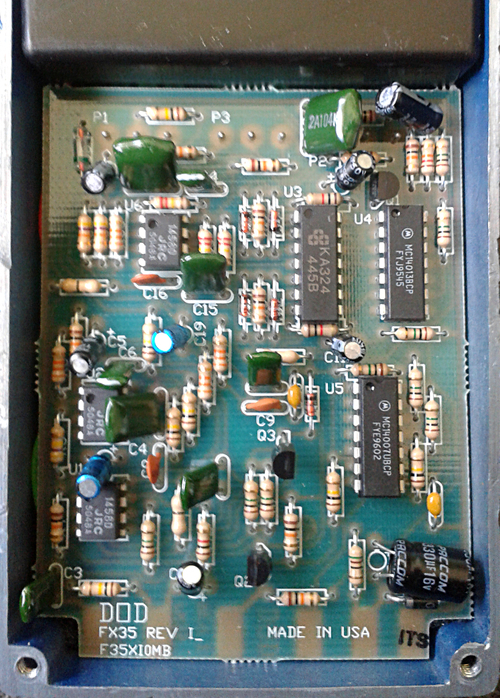 By testing and looking at everything else, i was pretty sure the design is the standard OTA-based compressor like so many others in the genre and from the era. 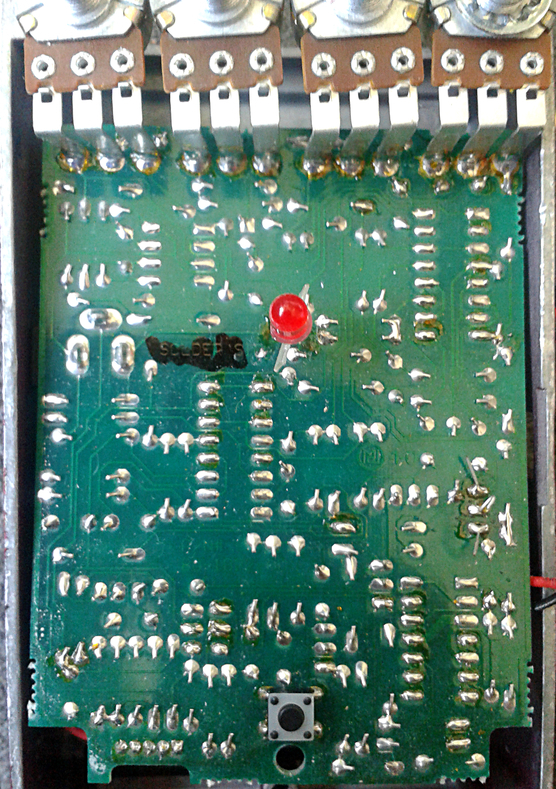 The stacked control board only houses the pots and and the indicator LED. 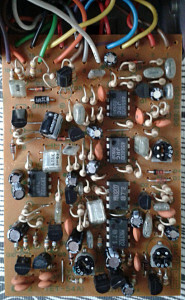 No other parts of the circuit extent to the control board. 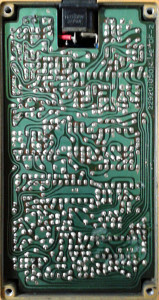 The image below shows the component side and its layout. 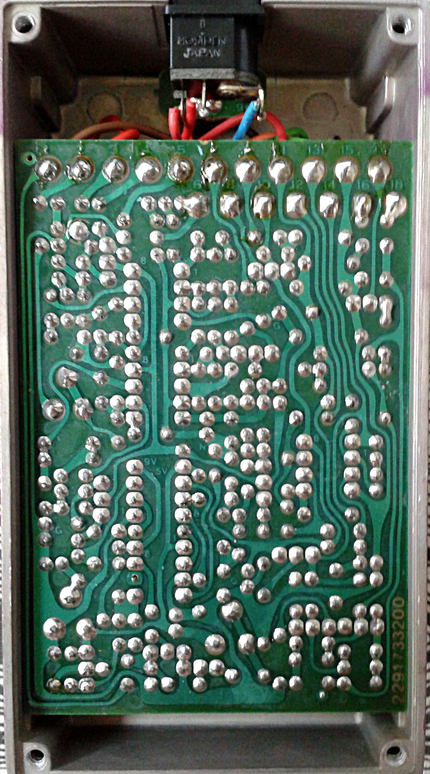 The switch (which someone has repaired with a piece of non-slip tape) and the electronic switching components are at the bottom. 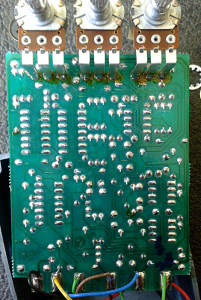 The diodes are for actual switching transistors that are grouped between the switching and jacks. 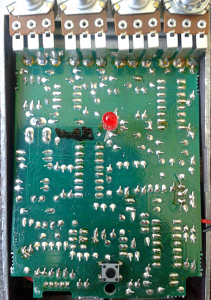 So the effect circuit itself is placed above the jacks. This actually sounds better than many modernized versions of the OTA compressor. The controls have good usable range and and the mushiness isn’t an issue. For the attack control, the feel is a lot better than for many similar designs. Despite its overall plastic feel, the sounds are very good. This was an interesting find and i’m actually very happy with the unit. Even if it doesn’t have the original push-on knobs in place. 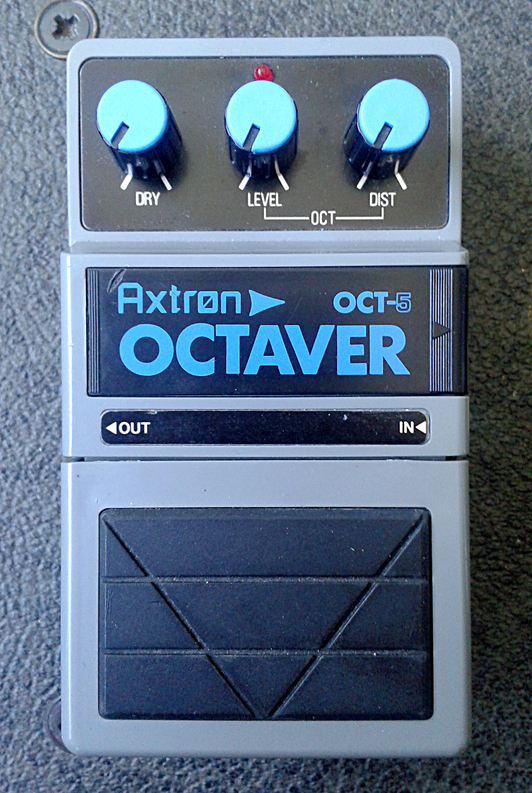 Axtron OCT-5 Octaver. Made in japan, possibly in the late 80’s or early 90’s. The sucker for down octaves that i am, i just had to get this pastic thing. It wasn’t even that cheap, but these japanese plastic oldies do not come by that often. So i went for it. There aren’t that many of these moving around, even in the other brand names these were offered back in the day. 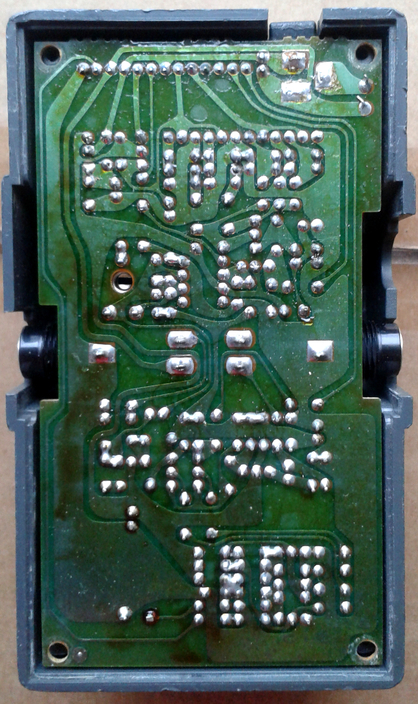 The same circuit in the same enclosure was apparently sold also under Axtar, Pickboy, Columbus, Profile+ and Vision brands. The same effect. In the same enclosure. Not that uncommon for japanese units back then. 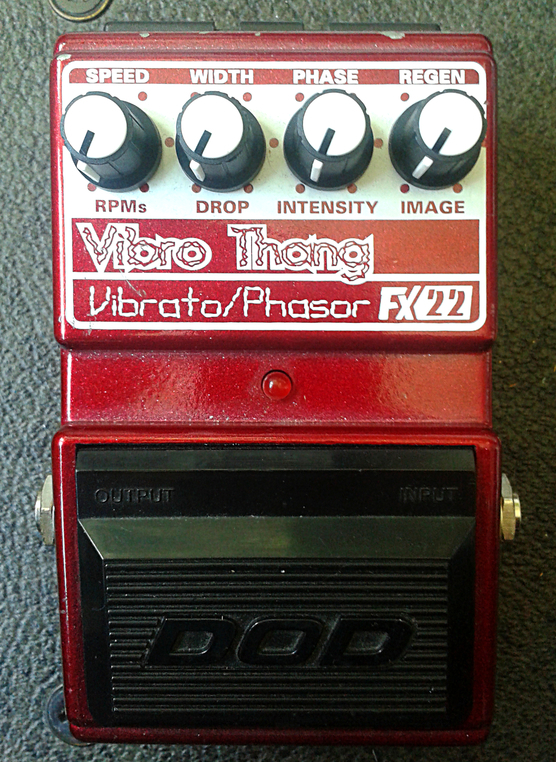 This series apparently had ten different pedals in its catalog. Haven’t seen many others for sale anywhere. Possibly the folks having them are still convinced they are worhtless garbage. That assumption is not that far fetched. The build quality is cool. 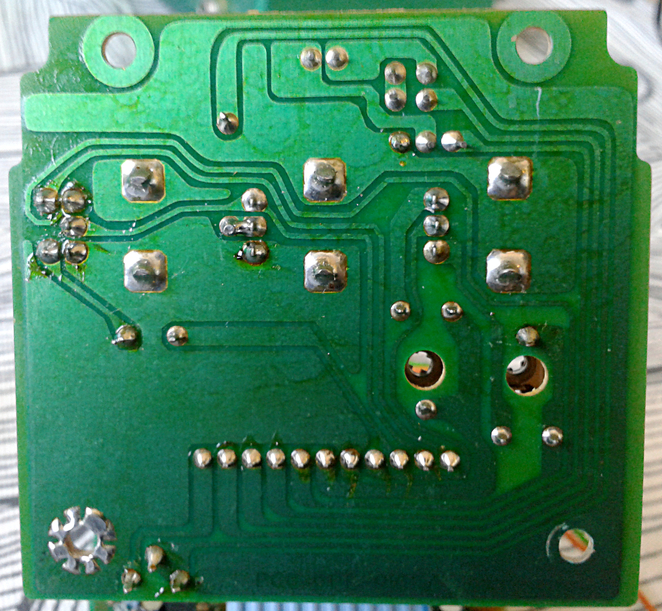 Hand drawn traces and neat solder joints. The sin of japanese designers in the 80’s was the plastic housing. If these units were housed in a metal case, the sales would most likely have been higher. 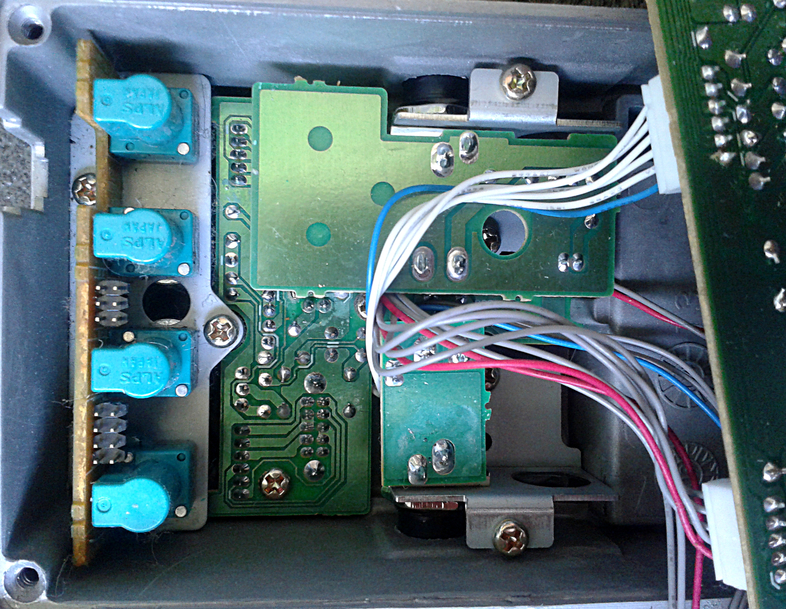 Nevertheless, the work looks good and the pedal utilizes the classic japanese two stacked board layout we’ve seen in many other units. 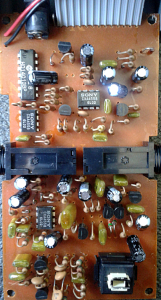 The elctronic switching seems to be similar to old Boss and Maxon/Ibanez flip-flop switching done with two BJTs and the actual switching by FETs. The effect circuit seems to be created with two Sony branded 4558 dual opamps and a 4013 flip-flop for the octave divider. 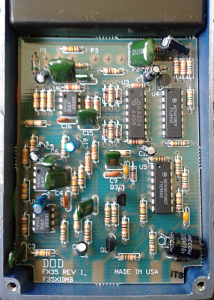 There are three knobs that control the clean signal level, octave down level and the distorted octave down level. 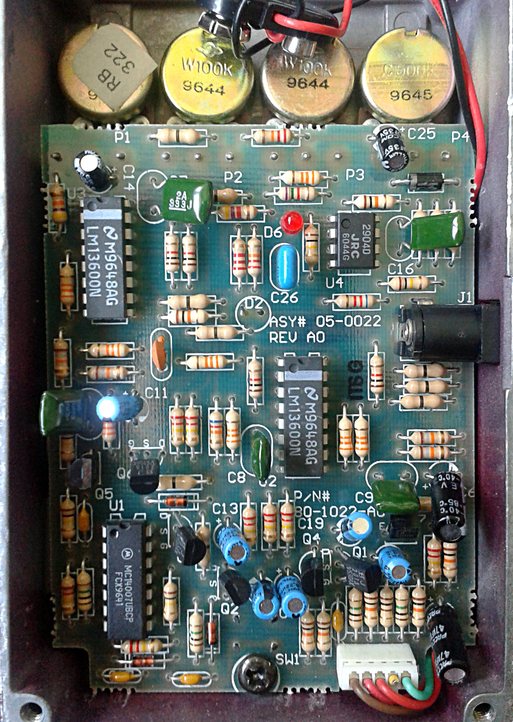 So it’s not exactly like the big sellers, OC-2 from Boss, MOC-1 from Arion and so on. The circuit seem to have something personal going on for it. 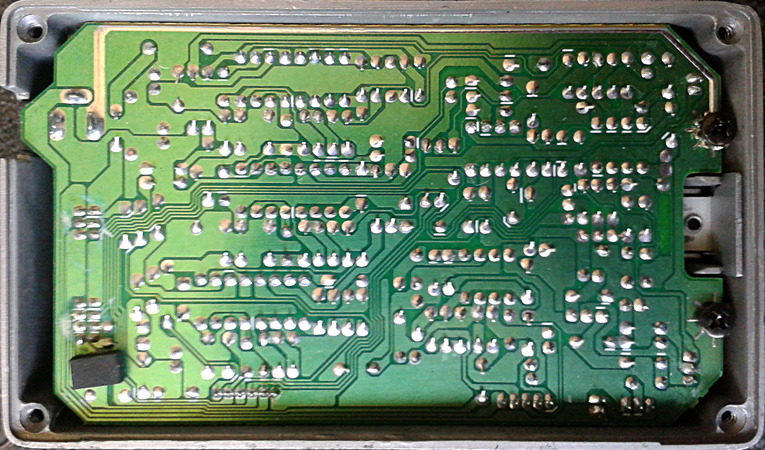 But even though it may be well made and the design of the boards look promising, there are some caveats. This being the biggest one. It’s a well tracking down octave, that’s created in a same way others have divided octaves since the days MXR Bluebox was first out (there may be earlier examples, but Bluebox is good to mention). 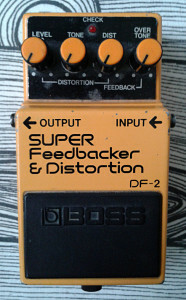 The distortion side of the effect also has a nice structure and texture. Nothing wrong with those. But. The overall level, even with all the knobs maxed is below unity. This renders the unit more or less unusable. 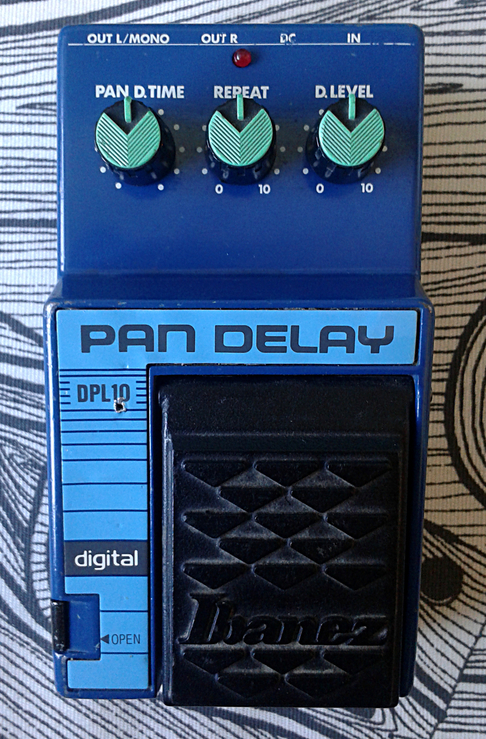 For a collector and a freak for down octave dividers, this may offer some value, but for anything else. Nope. Not that much. If you are not a collector, do not spend more than 25 buck for one. It most likely will not be worth anything more than that. May the brand be any of the ones mentioned above. 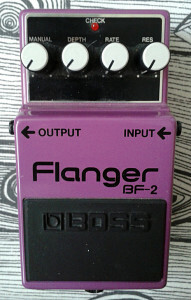 Boss BF-2 Flanger. Made in taiwan. No serial number and no enclosure date stamps. 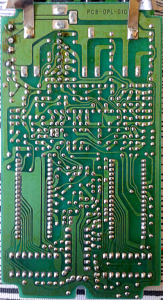 Even the electrolytic capacitors have no date codes. So it’s nearly impossible to determine the date accurately. 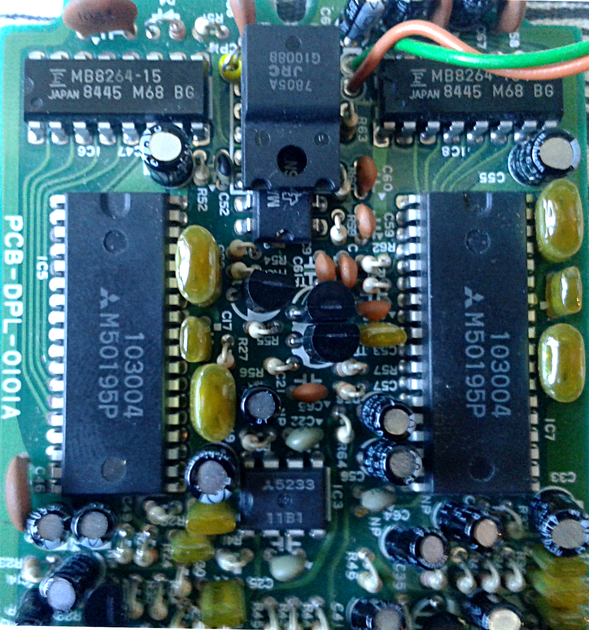 My best guess would be 1993, since dual opamp codes point to that direction. The japanese units apparently have all black knobs and the change to white top knobs happened around the time manufacturing moved to taiwan in late 80’s. 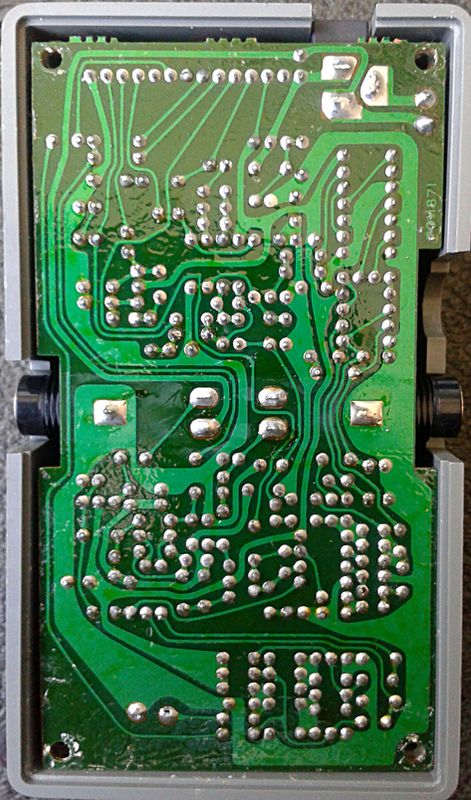 All the 00’s units i’ve seen have enclosure stamps on the stomp lid insides, but this one doesn’t. I’m going to let myself believe the unit is from ’93 and stop thinking about it. 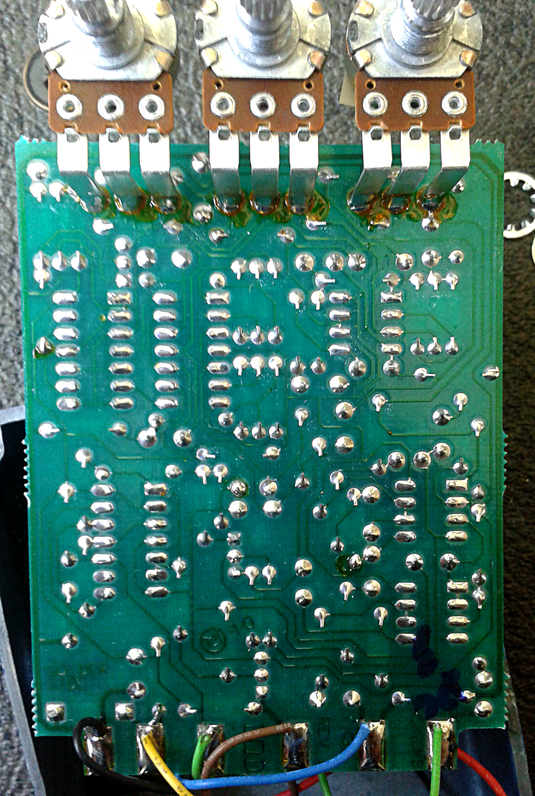 Board design in on par with earlier Boss pedals. This means that every little part of the design is japanese and the manufacturing only is done in taiwan. 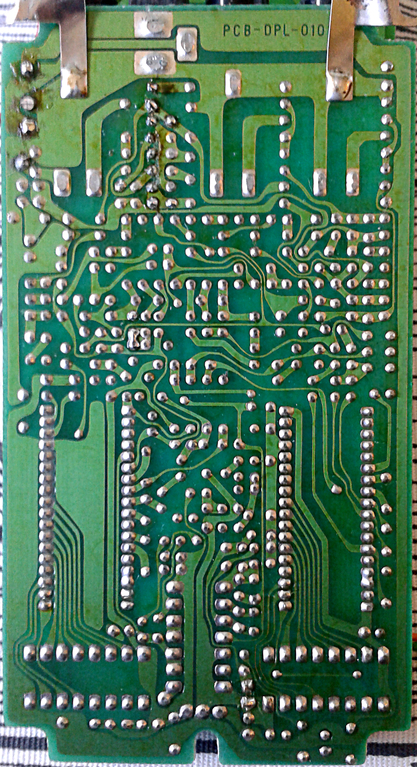 There are some of that super cool acidy feel on the traces and no sight of machine routing. It’s a pretty thing, that’s what it is. 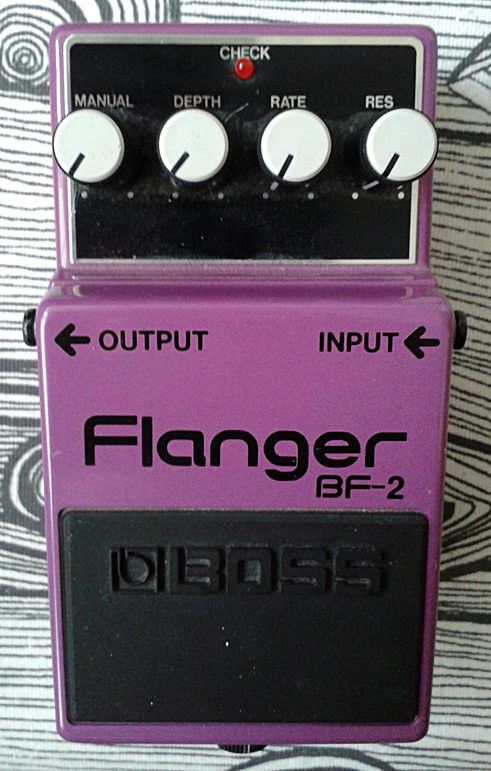 As a tiny history lesson, the circuit of BF-2 Flanger did take a long time in being a current device. The design was first introduced in 1980 and it discontinued as late as 2001. This and a few other facts are up at Boss Area. Check that out too. 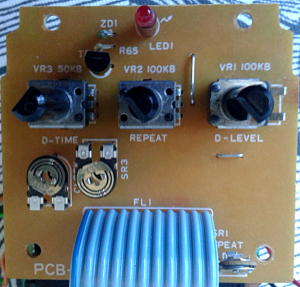 The schematic is up at Hobby Hour dot com. 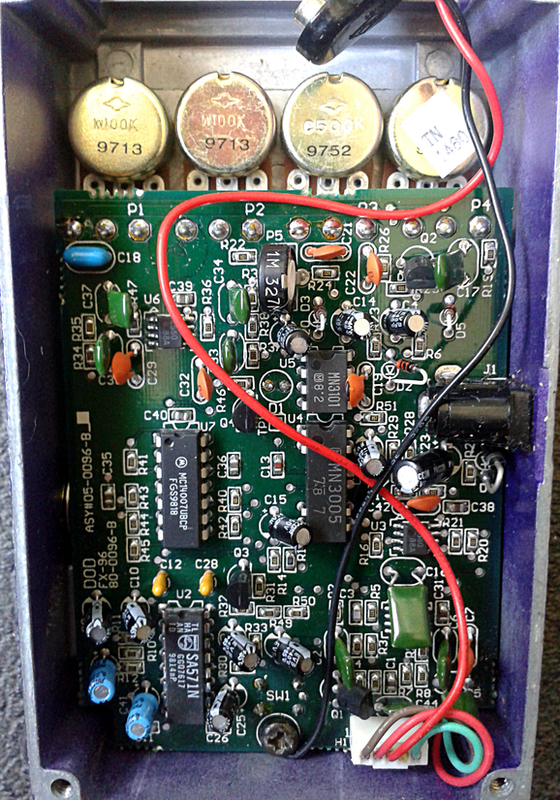 As the electronics go, my unit accepts the notorious Boss ACA power supply only. I’m not sure (and the Boss Area doesn’t say), but i think the later units were modified to be used with more standard-like PSA supply. 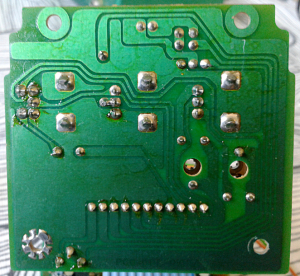 This means that there is a zener diode dropping the unregulated supply voltage to what the effect needs. There will be issues if this unit is powered with modern standard power supply all by itself. Daisy chained with other – then there’s no problem. Anyway. The buffering and mixing is handled by two 4558 dual opamps. 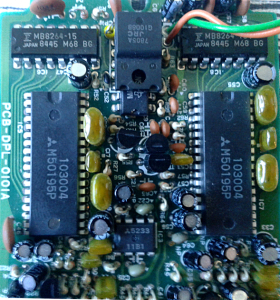 TL072 in some units (IR9022 in mine) is the LFO and the delay line is done with MN3207, a 1024 stage BBD and a MN3102 clock. So yes. Nothing special about it. Makes a great, solid, and versatile design though. The controls are Manual (affects the LFO operation), Depth (intensity), Rate (the speed of the LFO) and “Res”. “Res” is short for resonance. Or in this case, we get a bit clearer picture of its function if we would just simply call it feedback. Very good. 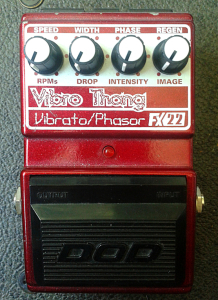 This unit is capable of mild chorus and vibrato to near airplane swooshes. 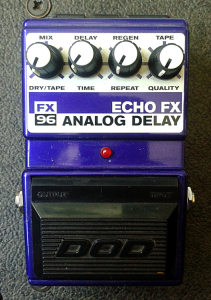 It does not do anything special or have a distinct personality in its tone, but it is a very good sounding analog flanger. 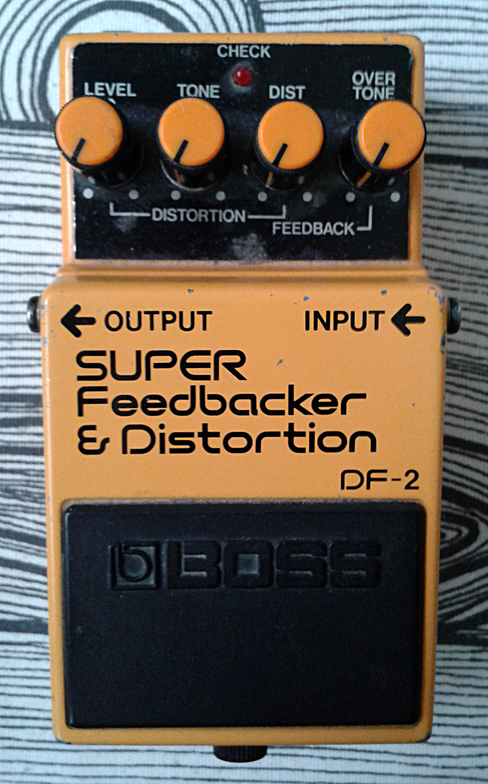 As a cardinal sin of Boss modulation effects, the rate range could be wider, but even that is better here than it is on Boss chorus effects. A classic. So scratching more area of collector’s world? In part, yes. 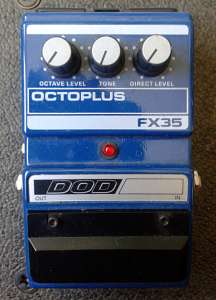 As some of you may already know, i do buy a lot of factory made pedals. As both new and used. I do trade a lot too, but let’s just focus on the buying part today. Why i named today’s writing as “buyer’s market” is a part of that. 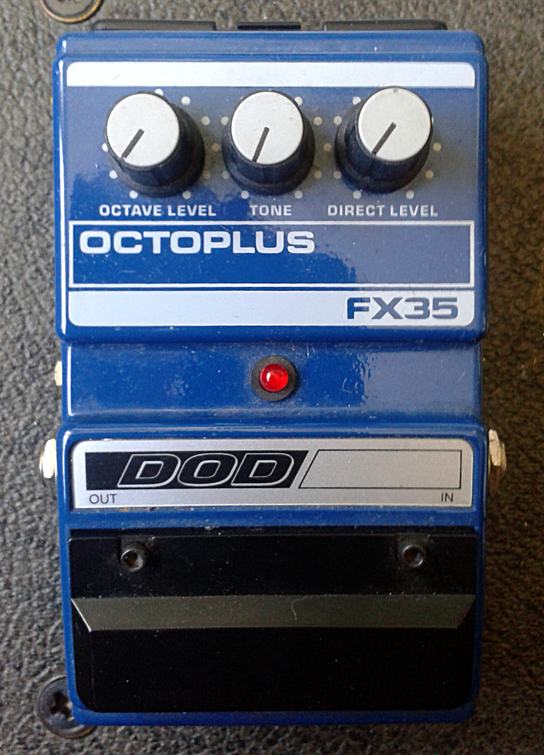 As with economy of supply and demand, there are pedals that are cheap and there are pedals that are not. As a collector, to find the sweet spot in pricing versus quality is a walk on a tightrope. Some brands are cheap to begin with, while others, it will be an understatement to call them expensive. Both, and everything in between will lose a bit of their street value the second they are driven out of the shop. Think of cars as a analogy. This analogy isn’t as far fetched as it might seem at first sight. You buy a Toyota, it will lose most of it’s value once you drive it off the shop. But. If you buy a Ferrari, the losses as percent are not as significant as with that Toyota. But you will drive that Toyota to the market, take your missus to work and it will offer you a lot of mileage before it turns into trash. For the Ferrari, you will only drive it a little to keep the value up. A Ferrari isn’t a tool. Now let’s look at the same thing with effects. I got perfect examples to offer for this thought. 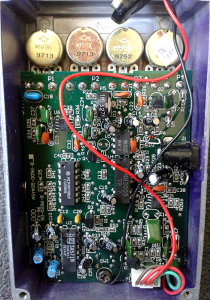 You buy a Digitech Tone Driver to boost your highs. It too will lose most of its value the second you take it out of the box. The losses aren’t as significant in percentage if you buy a *insert your top end boutique brand’s effect name here* as new and open that box up. But you will boost your highs with that Tone Driver in all the joints you can get yourself a gig. It will get its share of beer spills and its paint will chip from use, but it will keep boosting a long time before it turns to trash. 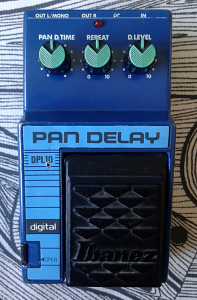 For the high end boutique pedal, you will only use it a little and keep it out of harm’s way to keep its value up. 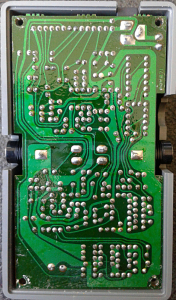 That pedal isn’t that much of a tool as it is a status symbol. Let’s face it. 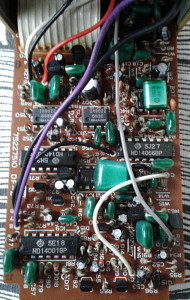 You really think 98% of the audience you’ll ever get will notice if you play with a Tone Driver or an overdrive that’s hottest hot at the guitar player forums? Or if they do, you are doning something else wrong that’s taking all the interest out of the music itself) Sure, the high end pedal will be a huge thing when you’re in studio, but is it really worth the money that gets you more than 20 Tone Drivers? Think about those questions for a second. The examples above give you two separate viewpoints. First, the price vs. usability. Then, the price vs. collector’s value. For me, i always do everything in my power to find the ones that follow the middle of the road. As low price as possible with as high collector’s value as possible. This means that i’m partially stuck with lower end brands (my enthusiasm with the electronic design and the learning aspect do play a big part too). But then again. What’s wrong with these lower brand name boxes? No that much. There are some serious gems in that range which may never gain the recognition they would deserve. The title of this writing goes deeper in to this. The number of Marshall BB-2 Bluesbreaker IIs manufactured vs. their price on the used market is a good example. I think i can safely say that for at least next twenty years there will always be more used and new units available than there is a demand for them. Which translates to Bluesbreaker IIs selling for ~25 €/£/$. That’s a lot of weight in metal and electronics for the price. And it is, in fact, a whole lot better device than the price would let you believe. These are the units that will be on the good purchase side of things for a long time. That 20 years will pass, but since there isn’t anything resembling a scarcity for these units in sight even then, these will not ever become highly collectable. As another example, let’s take the Danelectro Cool Cat series. The most common ones can still be found as new and for cheap. But there are units like CTO-1 and CO-1 which were manufactured for a short period of time and sold for peanuts when they were released. I’m still missing the CO-1 from my collection at the time of the writing. 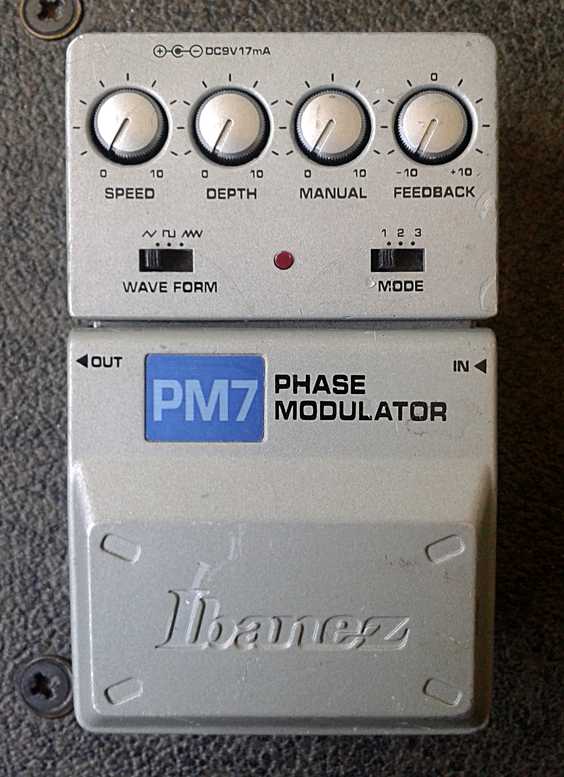 This pedal should be easy to find and it should sell for cheap. But it isn’t and it doesn’t. Without taking any stance on the electronics inside, the Danelectro Cool Cat series is already a collectable series. Launced in late 00’s and i’m under impression the tese aren’t made anymore. At least none of the big european resellers have any the these on their lists. That’s a way to create a series that isn’t praised on its release, but just five years later will become understood and wanted. 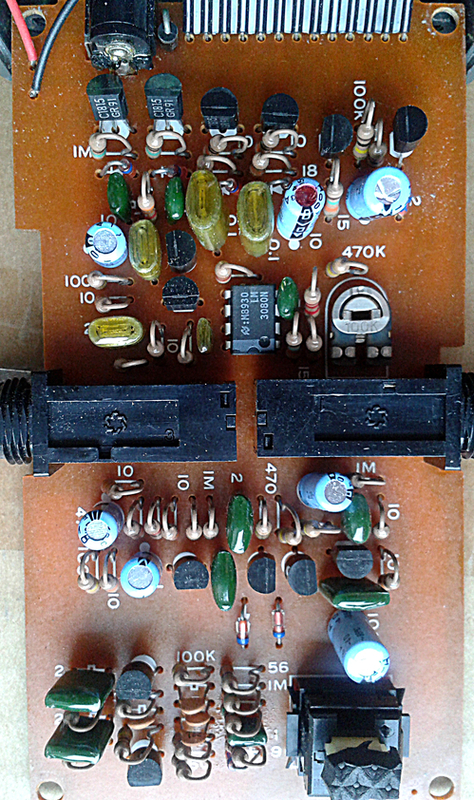 For the most of Cool Cat series pedals it is still a buyer’s market. Especially for the units that have their sounds right. 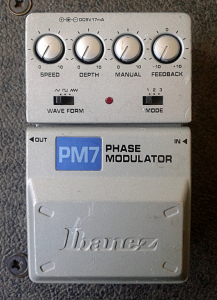 Lower end Ibanezes (5 and 7 series) are another good example of low price vs. collectability. 5-series will enter the “vintage” status soon, when the magical 30 years of age creeps on them. The 7-series is still cheap to acquire and the quality of these units will keep their value where it is now, or possibly even take it on the rise in following decades. All these are common and it’s a buyer’s market for all of them. There may be a few units that are more rare, but still. You should have to pay real big money for any of these. It may be just my opinion, but these factory made units are usually higher in build quality and design than many high end brands. These higher end brands do hold their value better, but then again.. Do they sound all that much better? Or is it just that we want to look like we know something that others don’t?